Born 1931 in Japan, a world known Japanese Karate master , the president of 'Shotokan Karate International Federation’, a karate organization he founded in 1978. While studying at the Takushoku University, Master Kanazawa joined the famous ‘Takushoku University Karate Section to learn karate. Master Kanazawa is among the few existing other karate-kas who have studied karate under the famous Master – Funakoshi Gichin, the founder of ‘Shotokan Style’ karate. Master Funakoshi was a Scholar, Calligrapher and Martial Artist (the name ‘Shotokan’ was from his pen name - ‘ Shoto’, ‘kan’ means the house he lives.). He was one of the karate Masters from Okinawa to introduce Karate to Japan mainland, attributed as being the ‘father of modern karate’. After graduated from the university, Master Kanazawa was being selected to join the famous’ Instructor Training Class’ of Japan Karate Association and graduated in 1957 to become one of the first group of karate instructors. In 1957, Master Kanazawa participated the ‘1st All Japan Karate Championship’ and won the kumite(sparring) champion. During the event, Master Kanazawa had an accident caused one of his hands broken and was considered to give up the competitions. However , in order not to let down his mother who came to see him from home town, Master Kanazawa determined to continue the competition and finally won the championship, this had become a popular story. The follow year 1958, in the same event, Master Kanazawa won the double championship for both ‘kumite’ and ‘kata’. Starting from the early 60s, Master Kanazawa was deployed to oversea countries including the United States, United Kingdom, Germany to promote and teach karate, with students in tens of thousands, was the International Chief Instructor of Japan Karate Association. In 1978, Master Kanazawa departed Japan Karate Association to found his own organization – the ‘Shotokan Karate International Federation’(SKIF). Under his leadership, SKIF is now probably the largest Shotokan Karate Organization in the world with hundreds of thousands students in over 130 countries. 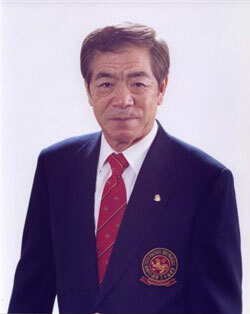 In 2002, the ‘International Martial Arts Federation’ of Japan Government presented Master Kanazawa the ‘10th Dan’ and ‘Founder ‘ title. He has then among few other masters who have received the same honor. Master Kanazawa spend his entire life in teaching and promoting karate-do, he is now still sparing large portion of his time teaching karate all over the world . His karate technique and knowledge, his remarkable personality, are being widely respected. He has become a living legend in the karate world.